Messiah’s Overseas Recruitment: Students’ Perspectives. In the late winter of 2011, President Kim Phipps, vice president of enrollment John Chopka, and assistant director of admissions for international student recruitment Cindy Blount, traded the cold of Grantham for the sunny climate of Asia as they arranged a recruitment trip to the region. One of their stops was a pre-university institution in Malaysia, Methodist College Kuala Lumpur (MCKL). They arrived at a campus where most students’ higher education plans focus on studies in Singapore, Australia, or the United Kingdom. On their trip, they presented the benefits of studying in the United States, especially identifying the strengths of Christian perspective integral to Messiah’s mission. 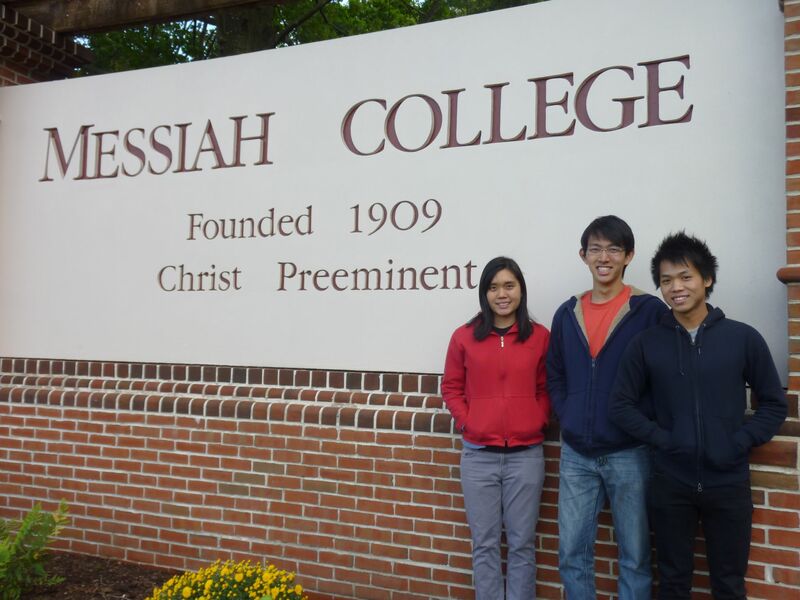 As a result, three students from MCKL enrolled at Messiah for the 2012-2013 academic year. While the college’s recruitment trip impacted their application, other individuals and factors influenced Bryan Leong, Joel Ngui, and Phoebe Chua’s final decision. Chua and Ngui were not present at President Phipps’ talk yet their decision to apply was largely influenced by Blount’s continual trips to the region and Veronica Yap, the USA Universities Placement Advisor and Counselor for MCKL. For Ngui, Blount’s recruitment drives at MCKL connected him with an idea of the American pedagogical style, the Christian aspect of higher education, and Messiah’s engineering program. Chua received direction from both Yap and Blount. The Malaysians’ choice of tertiary education depended on their ability to afford the high costs of overseas studies. Messiah’s financial aid structure and generosity was an answer to their prayers. Chua’s dream of teaching mathematics at the college level and Messiah’s generosity influenced her decision. For many international students, a leap of faith is required when making decisions of higher education. Even though the final choice is personal, the institution’s influence impacts the outcome. For the MCKL students, Messiah College’s decision to recruit in Asia, along with its generous financial aid, offered these individuals an opportunity many do not have: quality tertiary education. you can earn additional bucks every month. The Swinging Bridge © 2019. All Rights Reserved.